We don't need no badges! But handwarmers would be good. The news said today would be a little milder than Saturday. I headed over to the track in the morning because I felt like running around in circles. Ovals actually. The wind was present, but less intense than yesterday. I prepared for the 28° temperature and chose similar gear as the day before. One addition to my setup was an ASICS windbreaker. It was the same model I was wearing when a dog tried to eat me (but in black). I arrived at the track with no one else in sight. No other cars in the lot or track teams doing drills. Just me, the rising sun and the bitter cold. I parked my car and walked over to the track. I was deciding which direction to run when I felt a stabbing pain in my left quad. The gate latch to the track fence caught me just above the knee and it hurt like heck. 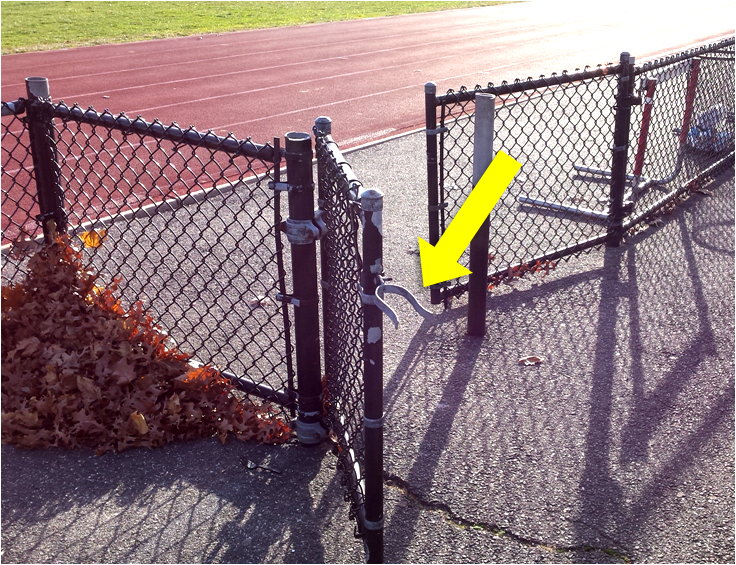 I worried that the latch had done enough damage to make today's workout a DNS. Once the initial pain subsided, I did some leg swings to stretch my leg muscle. After a few minutes I decided I could run. I started out counter-clockwise and immediately caught a blast of air to the face. My layers kept my torso warm, but my face and extremities were freezing. 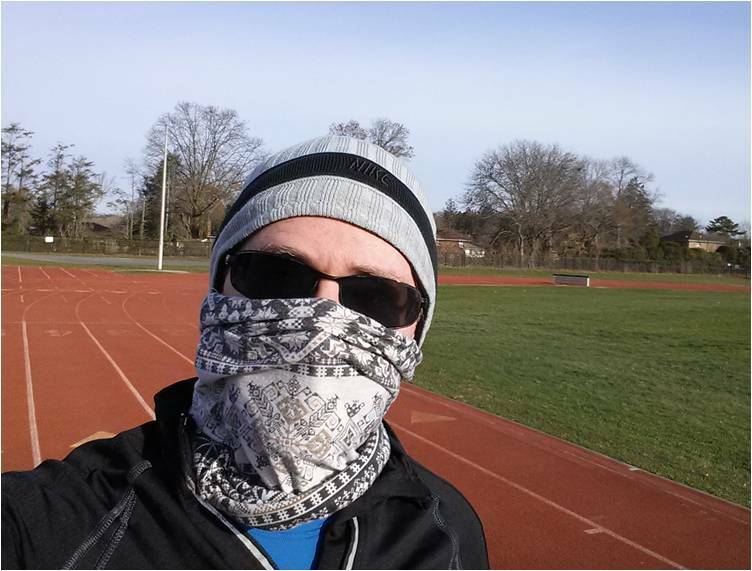 I pulled my buff up over my nose and under my sunglasses (to prevent fogging) and ran like that for a few laps. I looked like a masked bandito, but fortunately there was no one around to call the Federales. I rounded the track, keeping my eyes on the road for interlopers who might come by and ruin my serenity. I really like having the track to myself. I started getting warmer after a mile and a half and took a quick break to put my jacket back in my car. That was a good move and my last eight laps went by very quickly. My performance this morning was only so-so. Nine hours later, my quad is still a little sore but I don't think my run-in with the gate latch did any long term damage. It wasn't a great weekend for weather but not a bad one for running. The cold weather is here and I'm fine with that. Just as long as the snow stays away on days when I want to run outside. 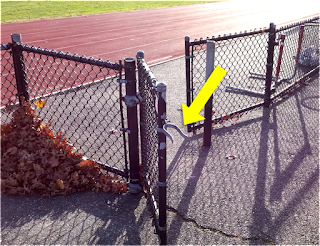 Good going, glad there were no serious aftereffects from that dastardly gate latch! I tried doing the exact same things as you yesterday at a nearby track but I'd neglected to bring any facial covering (I almost always wear something in the winter) and only made three laps before the biting cold on my face did me in. A lesson learned! Cheers! Thanks Brian. I've tried running with a balaclava but always had problems with restricted oxygen intake or fogging my glasses. My friend gave me a lightweight buff that easy to breath through and provides just enough protection to keep me comfortable. Good luck with your winter running. Sad to say, it won't be getting any warmer for a while! Did you notice that in your A Year Ago Today picture Kin is wearing a hat suspiciously identical to the thing around your chin? Just a coincidence. Mine is for bandits and his is for head warmth.